Not only is Coca-Cola one of the most enduring products, but its logo is just as enduring, having changed very little over the course of its 130-plus year history. Over that time it has become ingrained in American pop culture and art. The logo is such a popular design element, it can be found in kitchens and homes, as well as bars and restaurants. The first mascot Coke introduced into its advertising was the "Sprite Boy", a nickname given to him due to his elf-like features. Advertising and posters featuring him began appearing in 1941. 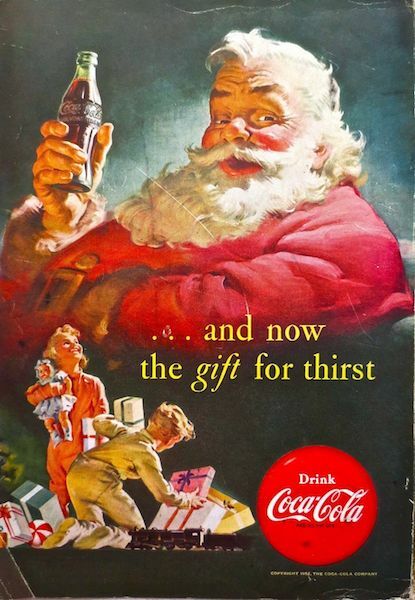 Santa Claus has been another popular salesman for the brand over the years. In the 1930's, American painter N.C. Wyeth was commissioned to produce several paintings to be used in conjunction with Coke's 50th anniversary. Today the distinctive bottle and logo can be found in art produced in every style and medium.